Lavender oil is a light, floral and herbaceous aroma with a woody, balsamic undertone. It is thought to be a calming and relaxing oil. Lavender oil was highly advocated by Rudolf Steiner for its balancing psychological affects. A digestive remedy often recommended by aromatherapists is to massage 5 drops of lavender oil in 25ml of carrier oil (jojoba, sweet almond or grapeseed) gently into the abdomen in a clock-wise motion. The soothing properties of the oil are absorbed through the skin and the massage helps increase blood flow to this area. Lavender oil has exceptional skin-enhancing properties, balances sebum production and encourages healthy cell growth. Lavender has been long-used to keep moths and insects away from clothes, by placing lavender pillows or sachets in draws or in between bed sheets. Lavender essential oil is extracted from the fresh flowering tops by steam distillation. This wonderful essential oil blends especially well with citrus and floral oils, in particular with cedarwood, clove, clary sage, pine, geranium, and patchouli. 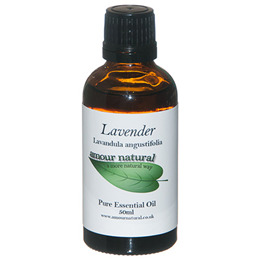 Below are reviews of Amour Natural Lavender Pure Essential Oil - 50ml by bodykind customers. If you have tried this product we'd love to hear what you think so please leave a review. Very happy with Amour Lavender pure essential oil. I use this daily and can find so many versatile uses for lavender - I cannot live without it! An exceptionally good quality oil - also very good value for money in the 100ml size which I need as I use it all the time! I am extremely pleased with the Lavender Oil, and am so very glad to have found your company, I commend you on how very prompt you respond to orders and how quickly I received. Thank you..